Then, 34 years later, ironically in 1989 the year Georges Simenon died, Charles Champlin revisits the mosaic description in this way: “Now the big novel is complete, and, as we can see, it ended in 1972 with the last Maigret (who is part of the dramatis personae, whether Simenon would have it so or not). And it will remain a quietly incisive and almost perfectly detailed portrait of French life across nearly half a century. It is a social history to set alongside the work of the great French novelists of earlier times. 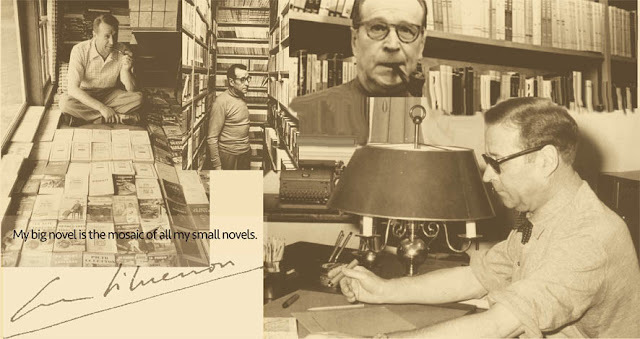 And it is such marvelous reading and re-reading.” (A Gift Extending to the Tips of His Fingers http://articles.latimes.com/1989-09-17/books/bk-462_1_georges-simenon/2). Thus, having only recently run into multiple writers weighing in on the big novel as a mosaic, I can’t help feeling a little smug that I arrived at this concept independently.